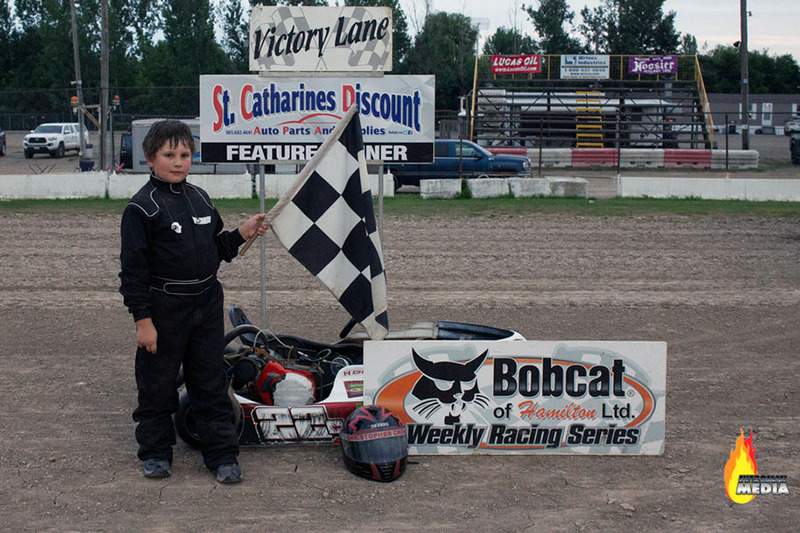 Merrittville’s Tuesday Night Bobcat of Hamilton Weekly Karting Series Racing got back after a rain out the previous week but it was worth the wait for two first time 2018 Feature Winners who visited St. Catharines Discount Auto Parts Victory Lane. Chris Crowe of St. Catharines who took home the 15 lap Feature in the St. Catharines Discount Auto Parts Junior 2 Division while former Street Stock and Mod Lite Racer Randy Hollingshead took the Wilder Racing Engines Senior Fun Feature win back to Hamilton. In other Performance Manufacturing Divisional action – two drivers would make their 7th visits to Victory Lane as Jaedon Lawson won the 15 lap Feature in the Superior PetroFuels Junior Restricted Division while Travis Majuery of Niagara Falls won the 20 lap Feature in the Southern Ontario Modified Lite Racing Association Senior Animal Division. The RCM Racing Equipment Junior 1 Division was not in competition. With the Harvey’s of Port Colborne Baron Roofing & Siding Big Block Modified Super DIRTcar Series 100 set for Monday August 6th – Kart Racing returns Wednesday August 8th. Pits Open at 5:30 and when the racing starts at 7 PM – Grandstand Admission is FREE. St. Catharines Discount Auto Parts Performance Manufacturing Junior 2 Division – 8 laps – Heat 1 Nigel Pendykoski, Chris Crowe, Trevor Evans, Hana Rothwell, Cohen Corbett, Owen Kaiser, Ben Colavecchia, Madelyn Goulding. Heat 2 Hana Rothwell, Trevor Evans, Chris Crowe, Nigel Pendykoski, Cohen Corbett, Owen Kaiser. Lexi Healy, Madelyn Goulding. Superior PetroFuels Performance Manufacturing Junior Restricted Division – 8 laps – Heat 1 – Jaedon Lawson, Logan Iliffe, Colton Lane, Jacob Mamo, Davis Grocott, Austin Nigh, Kyle Miller, Amber White, Brennon Wallace. Heat 2 – Jaedon Lawson, Colton Lane, Davis Grocott, Austin Nigh, Logan iliffe, Brennon Wallace, Kyle Miller, Amber White, Jacob Mamo. Wilder Racing Engines Performance Manufacturing Senior Fun Division – 10 laps – Heat 1 – Lenny Wiley, Randy Hollingshead, Jacob Broughton, Ron McGarry, Tom Matthews, Noah Mamo, Dan Lavallee, Shawn Konkle, Ken McLennan. Heat 2 – Randy Hollingshead, Tom Matthews, Ron McGarry, Jacob Broughton, Noah Mamo, Dan Lavallee, Ken McLennan. Southern Ontario Modified Lite Racing Association Performance Manufacturing Senior Animal Division – 10 laps – Heat 1 and Heat 2 – Travis Majuery, Devon Rayment. St. Catharines Discount Auto Parts Performance Manufacturing Junior 2 Division – 15 laps – Chris Crowe, Nigel Pendykoski, Hana Rothwell. Cohen Corbett, Trevor Evans, Owen Kaiser, Lexi Healy, Ben Colavecchia, Madelyn Goulding. Superior PetroFuels Performance Manufacturing Junior Restricted Division – 15 laps – Jaedon Lawson, Logan Iliffe, Jacob Mamo, Colton Lane, Amber White, Davis Grocott, Kyle Miller, Austin Nigh. Wilder Racing Engines Performance Manufacturing Senior Fun Division – 20 laps – Randy Hollingshead, Lenny Wiley, Noah Mamo, Jacob Broughton, Ron McGarry Tom Matthews, Dan Lavallee, Shawn Konkle, Ken McLennan.